"If you have a garden and you planted zucchini, you will have an abundance of squash blossoms. These are just amazing, with that tangy goat cheese filling and that batter: so simple, light, and crisp." Bring a pot of lightly salted water to a boil. Prepare a large bowl of ice-cold water. Drop squash blossoms into the boiling water until slightly wilted, 30 to 45 seconds; transfer immediately into the cold water to chill. Remove to paper towels to drain. 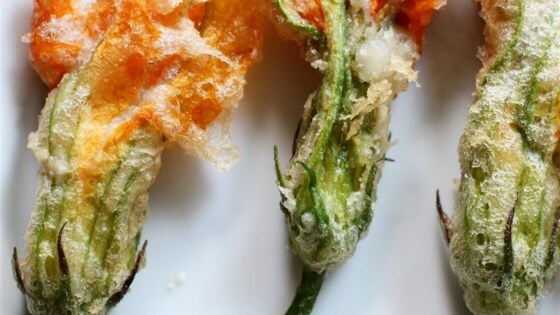 See how to make glorious fried squash blossoms. Use shredded Gruyere, Cheddar, Manchego, or any other firm cheese in the filling. DO NOT put blossoms in water... it destroys them!!! Wasted this treasure on this recipe. Remove the piston inside the blossom (just pinch it out) before stuffing. They are very bitter. I baked mine instead of frying and they are just as tasty! Delicious! Don't be afraid to try this recipe! If you are growing zucchini or yellow squash this spring, you must try these. Thanks Chef John!